Niall Horan urged South Korean pop band BTS to “keep your head on your shoulders” as he offered warm words of advice for their up-and-coming career. The seven-piece boy band are growing in international popularity and earlier this month became the first band of their genre K-pop, an abbreviation of Korean pop, to break into the top 10 in the US album charts. 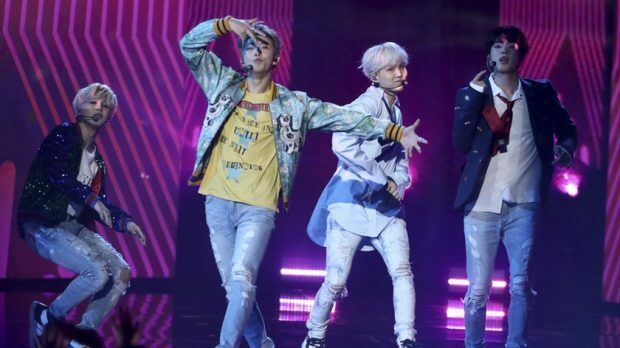 BTS attracted a wave of attention as they made their US television debut with a performance at the American Music Awards (AMAs) on Sunday night. Horan, who picked up the prize for new artist of the year at the glittering ceremony, sang their praises and offered some perspective thanks to his days with global boy band sensation One Direction. He told US publication Billboard: “I’ve got to read up a little bit about (BTS) recently and see the commotion that they are causing and it’s amazing, I think fair play to them. “They are obviously huge out in Korea… then they come over here, taking the place by storm. I watched their rehearsal and I think they’re great. Among the other stars to share their love for BTS was Baby Driver actor Ansel Elgort. Speaking at the Los Angeles event, he said: “I am a big BTS fan. I love them, I’ve met them a couple of times and I saw them in Korea while we were promoting Baby Driver. BTS, who have more than 10 million followers on Twitter, also received nods of appreciation from actor Jared Leto and DJ and producer Marshmello following the event.